Last term when we studied Microprocessors with Dr Moustafa, it was fine, even though I wasn’t much into the subject itself, but I saw something new in Dr Moustafa that I wanted to learn from. This term, with Embedded Systems and Operations Research, I learned dozens of new things, new techniques and new ways. And when we complained by the end of this term, I was so happy he listened to us and told us “Whatever you want, the most important thing is that you understand what you study”. It showed the real intentions of what he did all year long, and it showed a real kind heart. 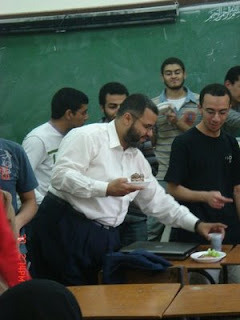 That is why I believe Dr Moustafa is one of those people who left a deep mark in our lives and minds… Also, he was the only professor who shared with us the first “CSED 2010” party!! It certainly means a lot to us! I enjoyed embedded systems … I suppose we all did… I am glad we studied stuff no one else does, like Android. I benefited a lot from Operations Research; I wish I had more time to invest in it! I even started looking on Wikipedia to know the solution of the Prisoner’s Dilemma before it was explained in class!! Thanks for creating a change! - Kefaia noory ya fandem! - welba2y?? masama3nash ya doctor!!! - b2eeedak ya fandem.. ommal te3raf enaha sha3'ala ezai? - any comments 3al sections wel labs ? - fe 2oroba we el dowal el motakadema ! To Dr Moustafa Amin , our university professor who taught us Microprocessors, Embedded Systems and Operations Research (and Networks in the future :) ). You taught us things of all different kinds. No! I’d rather say “Thanks to you”! You’re our friend who is so dear! "Those who don’t take undergraduate courses with Dr Moustafa lose a lot"
And, you will feel the power of the pressure he (and others Drs) put you in, when you go to real life world (work), There, you will see how other developers who came from other universities "BEYFAYASO" after 5 "working hrs" per day, whenever ALEX-CSEDians can be fully productive for more than 10 hrs per day, and can act under deadline projects deliveries high pressure. You will appreciate what he gave you, and you thought it was " TANFEE7' "
Very nice post .. totally agree with you , i think Dr. Moustafa is one of the best examples from which we can learn about time management. 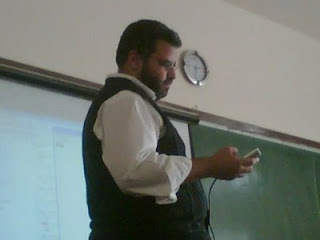 Dr. Moustafa is one of the BEST 'teachers' I have seen in ALL my life. Thanks Dr Moustafa for the CHANGE! Thanks Evronia for the great post. The blog post was forwarded to me by Eng. Amr. Thanks all for your nice words that I don't deserve, especially Evronia who started it. If there is anything I should comment on, it is that each one of you should try hard to make a change, and all of you can. P.S. Five bonus marks Evronia :-). Just kidding. I am so glad and happy with your comment really.. It's an honor to my blog :) And of course you deserve it all ! You're welcome doctor and thanks again to you ..